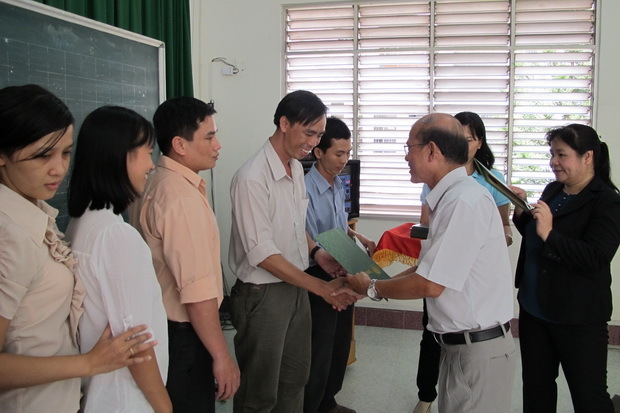 The closing ceremony for the English training course for 105 secondary and high school teachers of English in An Giang province was held on May 19, 2013. The course aimed to help the learners improve their English language proficiency, be equipped with essential academic knowledge and skills to meet the requirements of An Giang Department of Education and Training on the English proficiency to successfully realize the goals of the National Foreign Languages Project 2020. In addition, the course also prepared them for the English language proficiency test and developed strategies for self-directed learning for their professional development. The course lasted for 12 weeks from February 23 to May 19, 2013.